A competency framework or leadership behaviours model should act as a blue-print of what brilliant performance looks like. We consult and engage with your people to develop competences that reflect your tone of voice and ambition as a business. Whether you are looking for a new model or refreshing an existing one, we can capture your organisational DNA in specific, behavioural terms. 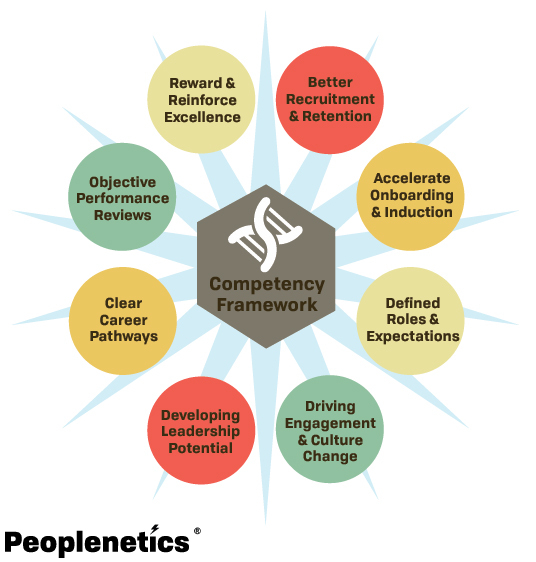 A well developed competence framework should be an accessible, practical tool that shares what great performance looks like in simple, concrete terms with all employees. It can provide the backbone of many people management processes, e.g. recruitment interview assessments, performance appraisals, leadership development, etc. A competency framework is a simple, clear model that describes all of the underpinning behaviours that predict success in your business. The model should set a stretching standard against which employees performance can be benchmarked, and job applicants can be assessed against. It should act as a clear blueprint or roadmap for your people to help them understand how to improve their performance, and progress their careers to the next level. We can provide a proven, fixed-cost model to develop your competency framework, or refresh any existing model to ensure it is fit for the future. We will consult with your key business leaders and involve your employees to ensure that your competency framework is credible, reflecting the vocabulary and behaviours relevant to your organisation. A well-designed competency framework provides a common understanding and consistent approach to measuring performance across the business. It should serve to embed real behavioural change, and help people adapt to future demands. Importantly, the framework needs to be practical and effective for line-managers to implement and use with their staff for e.g. appraisals and performance reviews. We can help your organisation, whatever size it is, develop or update your competency model, ensuring that it meets your current and future business objectives. We are Occupational Psychologists who can fix business problems and help you realise your Talent and People objectives. We are collaborative, responsive business partners. Lets help your people be brilliant..as often as possible.